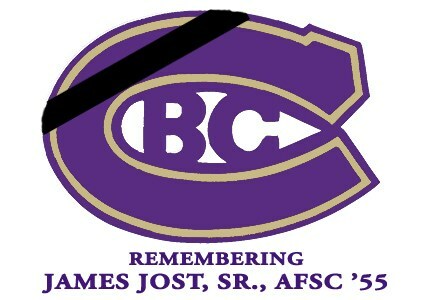 The CBC family mourns the passing of Mr. James Jost, Sr., AFSC, a graduate of the Class of 1955. As most in our community know, Mr. Jost has served as the president of the CBC Hockey program since 1976. Under his leadership the Cadets have become the most successful high school program in the state of Missouri, but his support of CBC's Lasallian mission has made a lasting impact that extends far beyond the ice. Together with his wife Virginia, the Josts have become two of CBC’s proudest and most distinguished advocates. Their many gifts include the establishment of the James and Virginia Jost Scholarship, which will continue to create educational opportunities for young men long into the future. Mr. Jost's commitment to his faith, his family, and his community is a shining example to us all. A visitation will be held at CBC this Tuesday from 2 p.m. - 8 p.m. Mr. Jost’s funeral will also be held at CBC this Wednesday, beginning at 10 a.m. In lieu of flowers, the Jost Family has asked that donations be made to the James and Virginia Jost Scholarship at CBC.